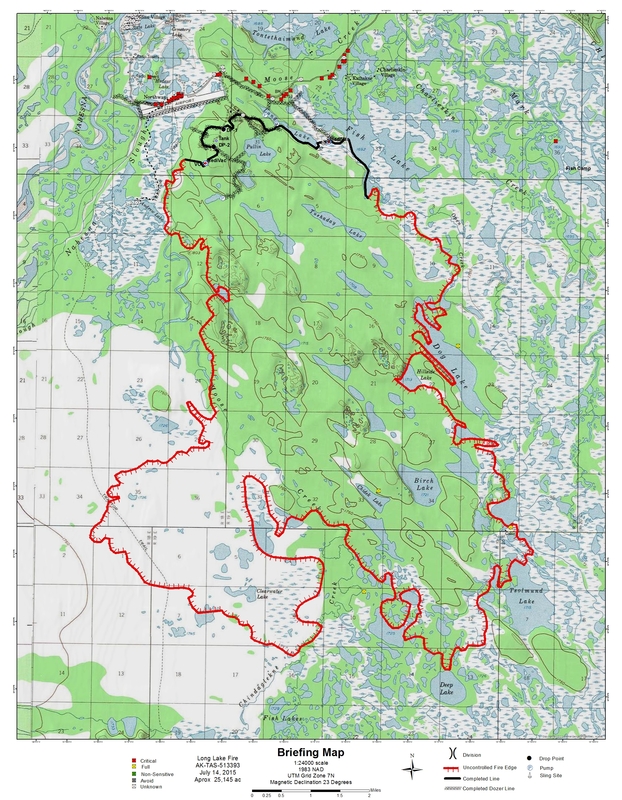 (Tok, AK) – Warmer and drier weather has increased fire activity on the Long Lake Fire. Due to the warming trend, smoke can be seen from the Alaska Highway. Fire resources continue to be shifted from the Tetlin Hills Fire to the Long Lake Fire increasing operational numbers to achieve containment objectives. Tetlin Hills Fire – Crews observed trees killed or weakened by the fire falling across the containment line yesterday. Partially burned, standing trees called snags and have partially burned-out bases, which are very susceptible to wind throw and could fall at any moment. Many trees have bases that have burned through, have fallen, and are leaning into another tree. These trees are dangerous and could fall at any time, especially during windy days. These hazard trees are being mitigated to increase the safety of the firefighters and reduce containment loss. Firefighters have completed seventy percent containment primarily on the south and east perimeters. Crews will continue to improve the northeast, east and west dozer lines to prevent fire spread. Currently 126 firefighters are working on the Tetlin Hills Fire. Long Lake Fire –– Progress continues despite the rough terrain on the western perimeter as crews construct line to Andrew Lake. Containment of the northern perimeter remains a priority to keep fire south of the Northway airport. Moderate fire behavior is expected again today which will help firefighters secure structure protection efforts on the remote cabins on the east side of the fire. Strategic helispots are being constructed to optimize operational tactics. Incident Command Post (ICP) is located at the school in Northway, Alaska. Currently 167 firefighters are working on the Long Lake Fire. Contact: Public Information Officer, Sarah Saarloos at email: tokareafires@gmail.com or call 907-356-5511.